In the past three posts of this series I have covered the definition of a platform, followed by a brief analysis of the big four players in the customer experience world, namely Microsoft, and SAP, followed by Salesforce and Oracle. Of which there are mainly four, although Gartner Group lists six of them in their 2018 Magic Quadrant for Cloud Infrastructure as a Service, Worldwide! And this drop from 14 vendors in 2017 to just six in 2018 already shows how much consolidation is going on in this market. But why even mention them here? After all this text originated as an analysis of the big business software vendors. 1. They do provide the raw computing power, the storage, networking resources, etc. for business workloads in a highly elastic way – including the ability to scale up and down in (near) real time. 2. IaaS platforms also more and more contain and offer the PaaS portion that is necessary to offer value added services. In essence, the big six of the IaaS providers that are covered by the Gartner Group offer a technology platform, an ecosystem, insight, and productivity tools. The only thing that they are not really doing – yet – is offering rich, integrated business applications. But back to why I do see only four main IaaS providers going forward. 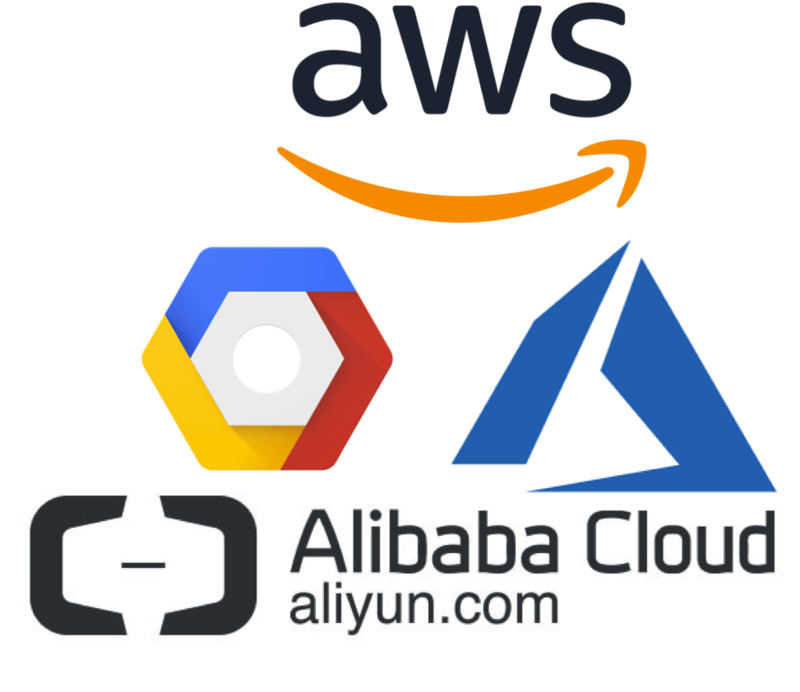 These famous four are AWS, Microsoft, Google, and Alibaba. Of course with AWS having a tremendous lead for now, with Google and Microsoft struggling for the second spot, and with new kid on the block Alibaba growing bigger in their rear view mirrors. IBM and Oracle, similarly to venerable names like Rackspace, Fujitsu, NTT, and the other ones that dropped off the quadrant, will become niche players. Oracle, already one of the Titans, concentrates on Oracle database and Oracle application workloads. While the Oracle DB arguably runs best on Oracle hardware this will not prove to be a winning value proposition for companies that have the choice between highly performing databases. And even when running an Oracle DBMS they might opt for somebody else’s cloud. Similarly IBM. Although they are moving away from a hardware company towards being a services company there is a lot of legacy around them. This legacy will be hard to shed off and this will diminish IBM’s ability to fully compete as an IaaS vendor on a global scale. Both of them will survive – but they will not get anywhere near the market presence of the IaaS titans. Starting with the new kid on the block: Alibaba. Alibaba’s home turf is China. The company, however, is very actively enlarging its footprint and reach. By now it is offering more and more services that are available in China worldwide. Still, not everything that is possible in China, is possible elsewhere. However, with its protected homeland the company is able to mature offerings in a ‘safe’ environment before offering them in the highly competitive ‘rest of the world’. Partnerships like the recently renewed one with SAP show an increased credibility. Additionally we should not forget that Alibaba with its retail business is similarly capable of providing data services that only Amazon or Google could possibly compete with. Alibaba is a (distant) number four in this quartet but certainly a force to be reckoned with. Which brings me to number three: Google. Google is providing an integrated offering that basically commercializes the technologies that the company needs itself. In this it is similar to Alibaba and AWS. In contrast to the other vendors it, however, is dealing more with open source software and is open sourcing its software. It shows that open source can be a very successful model. While the overall offering is less broad than the one of AWS its AI and ML capabilities are very high, based upon the unrivalled amount of data that the company ‘owns’. A challenge that Google has – and will continue to have – is the ability to attact large business workloads. Although SAP partners with Google (as well as with Microsoft and AWS) I do not think that they will get a strong foothold in this area, especially competing against Microsoft and Azure. On the other hand GCS is the ideal ‘entry drug’ for smaller and aggressively growing businesses. Azure is attractive for large businesses as it arguably can run very large workloads. Azure is attractive for SMBs as it is easy to integrate various pieces of the platform (remember: technology platform, insight, ecosystem, productivity). All pieces are available and tie well into each other. This is one major reason why other enterprise software vendors should be wary of who they hunt. Instead they should sometimes have a look into the rear mirror to cover their back. AWS is still leading the pack with quite a margin. Since its invention the company shapes the market by a seemingly neverending array of new services, supported by price cuts that are made possible by the sheer scale to which the platform grew. Amazon’s offering is probably the most complete around. Apart of being a very strong in SMB and new economy businesses the company has partnerships for example with SAP and with Salesforce, or with Workday, to name just some, that help it getting enterprise workloads. Still, from its very origins AWS is still less attractive for traditional enterprises but more for the maturing kids of what was called the ‘sharing economy’. On the data frontier it is powerful, but lacks a few of the capabilities that Microsoft has. On the other hand AWS has its hand on behavioural consumer data that can easily get commercialized. Amazon’s AWS is still the power that no one can ignore. However, there are now three competitors that cannot be ignored, either. Especially not by AWS itself. Right now it is probably too early to do any forecast but one thing is for sure: Things will get exciting. Amazon AWS is vulnerable. Vulnerable on the data frontier and on the enterprise workload frontier. It is not a given that AWS stays the undisputed leader. In fact, I’d wager (sorry, no forecast) that AWS gets attacked from multiple angles. Microsoft will get more of the enterprise type workloads that AWS needs. Google has a good chance to tackle Amazon from the small business side of the house, while Alibaba has the potential of becoming a full blown tsunami, covering small biz to enterprise workloads, just like AWS does. One thing is for sure in this part of the clash of the titans: A competition of more than three players keeps the heat on by enforcing customer facing innovations and price models.